If you are looking for that ultimate remote control solution for your Compustar remote car starter, then DroneMobile is it. 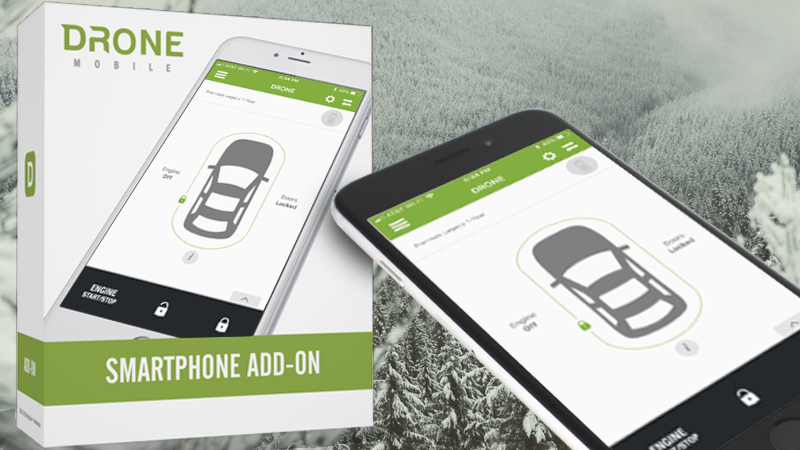 By combining the convenience of your smartphone with an interface module in your vehicle, the DroneMobile system allows you to control door locks, remote starter functions and even accessories like trunk release from almost anywhere. As long as you and your vehicle are in an area with cellular coverage, you are in control. DroneMobile is a remote control solution for your car starter that combines hardware in your vehicle with software on your smartphone. The hardware is based on a compact cellular radio module. Think of this module as a smartphone, but without the microphone, speaker and display. The module is installed in your vehicle and communicates with your remote car starter digitally to relay commands and information. The second part of the DroneMobile system is a software app on your smartphone. Apps are available for Apple iPhones and Android-based phones. The app lets you send commands to, and receive information back from, the remote starter in your vehicle using the phone’s Internet connection. That’s right. As long as you and your vehicle have cellular data service, you can start your car. You can be anywhere in the world and have complete control. DroneMobile gives you virtually unlimited range. Why would I want to use my Smartphone? The most common application for DroneMobile is in situations where a handheld remote fob doesn’t have enough range to control your vehicle. You can be on the other side of a warehouse or factory, or on the other side of town, and still be able to remote start your vehicle. Letting the engine of your car or truck warm up for as little as 3 or 4 minutes on a cold winter day can save a lot of wear and tear, and make it much more comfortable when it’s time to drive away. Here’s another scenario: What if you lock your keys in your vehicle? If you happen to have your phone in your pocket, you can unlock the vehicle from the app in just a few seconds. Let’s say you left your phone in the car? You can borrow a friend’s smartphone, download the app, log in and tap the Unlock button. A third option is to log into the DroneMobile desktop app from any web browser and send the unlock command from there. No computer nearby? Pick up one of those old-fashioned landline telephones and call a family member; they can log into the desktop app for you. Start the Car with a Smartphone? Using DroneMobile is easy. Let’s say you want to remote start your car while sitting at your desk in a large office building. Launch the DroneMobile app on your phone and tap the Engine Start/Stop button. The app will send that request to the DroneMobile server using your phone’s Internet connection. The server relays that command to your vehicle over the cellular data network. The vehicle will start, then report back to the app that it’s running. The whole process takes only a few seconds, making DroneMobile the fastest connected car solution on the market. The DroneMobile application offers complete two-way communication with your vehicle. If you want to know if your car is locked or the engine is running, an icon on the screen will show you. Additionally, your vehicle’s battery voltage and internal temperature can be displayed within the application. If you have opted for a security system, you will get instant alerts if the DAS sensor is triggered or if a door is opened. The App includes a sub-menu that is accessible by swiping up on the car icon. This menu includes the Aux 1, Aux 2, Trunk Release and Panic Mode control buttons. Your installer can configure the auxiliary outputs to control vehicle options like a power sliding door or rear hatch glass release. If you have a DroneMobile system in more than one vehicle, the app will let you choose which one you want to control from a list. The DroneMobile app is compatible with Apple Watch and Android Wear, so you can start your car from your wrist and see notifications from the system. You can also integrate locking, unlocking and vehicle-locating functions into Google Home and Amazon Alexa. If you are looking for the ultimate solution to control the remote starter or security system in your vehicle, then visit your local authorized Compustar retailer and ask about DroneMobile. They will work with you to design a remote car starter solution for your vehicle and explain the cost of the system, the installation and the service plan options to you in detail. Eliminate range anxiety forever – have a DroneMobile system installed today.